Born in Bulawayo (Zimbabwe), Charlene moved to South Africa with her family at the age of 12. At the time, the future princess could not imagine where her passion for sports would lead her. Inheriting a love for swimming from her mother, who herself was a diver and swimming coach, Charlene was passionate about water sports from an early age. When she was 16, Charlene dropped out of school and dedicated herself to her swimming career. After two years of hard training, Charlene found herself on the podium of her first South African championship. Four years later, she qualified for the 2000 Olympic Games in Sydney as a member of the South African 4x100m medley relay team. They finished fifth, that year. That same year, Charlene took part in the international swimming competition, Mare Nostrum, held in Monaco. That is where the 22-year-old Olympic swimmer met her husband-to-be—the Hereditary Prince Albert II. Apparently, the ice-cool blonde won his heart once and for all. Six years later, the couple made their first public appearance together at a competition in Turin, Italy. By that time Albert had succeeded his father and became the ruling Prince of Monaco. At the time, Albert’s beloved did not seem to care about his past love affairs involving models and Hollywood stars, and two illegitimate children as a result. Charlene and Albert couldn’t have been happier. In 2010, the couple announced their engagement. 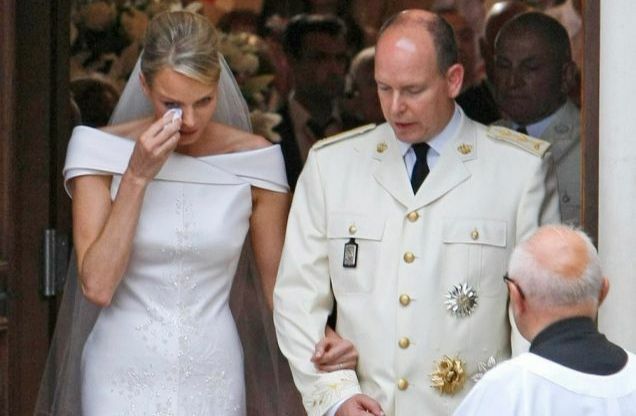 “I want her [Charlene] to be part of Monaco’s life”, said Prince Albert about his future wife. A year later, on 2 July, they sealed their love in front of the world and the Principality finally had a new Princess. “Everything started in 2001, when Charlene enjoyed her holidays in Monaco. She was sitting at the table in the Hotel Tulip when Albert came over and invited her to dinner. “I have to discuss it with my coach”, she said. “The answer ‘no’ would be incorrect”, responded the smiling future Prince of Monaco. The Turin competition in 2006 was the starting point of their way to the royal wedding. Albert and Charlene did not keep their romance secret anymore. All eyes were on the loving couple. Would it be the last romance in the string of Albert’s love affairs? In 2007, Charlene moved to Roc Agel, the Grimaldi summer residence. Together with Albert, she attended official events. With her flawless style, the South African swimmer was wiping the memories of Albert’s past love affairs from the mind of the Monegasque people. Two years later, Monaco felt like home to Charlene, who behaved like a real princess at the Rose Ball, chatting with Karl Lagerfeld and dancing with the Prince of Monaco. There was no doubt the royal wedding was coming. However, shortly before the wedding ceremony, the press was buzzing about Charlene allegedly seen at Nice airport asking for a one-way ticket for Johannesburg. But the official statement from the Palace, released a couple of days after the incident, denied the allegation. The lavish wedding ceremony brought together a large number of famous guests, including Naomi Campbell, Nicolas Sarkozy and ex-Bond actor, Roger Moor. But all eyes were on the bride who was crying as she walked down the aisle. Tears of joy? Probably. Later on, the Princess confessed: “The ceremony was very important, and I was stressed. When I felt tears on my chicks I thought ‘Oh, no! Now everyone sees me crying,’ and I burst out in tears”. Today, Charlene takes care of her two children, Jacques and Gabriella. The royal twins were born on December 10, 2014. The Princess stays busy with charity work and developing of her own foundation. She still participates in sports competitions, though her swimming career ended in 2008 due to a shoulder injury.